Extended Order Grid module makes order list page much more functional. This admin extension empowers you with such abilities as displaying all the necessary order info, including product images, on the order grid page, searching and sorting of orders by product name, SKU and other product attributes. Customize sales grid and save time working with orders. We have a new Order Manager Toolkit module, which has all the functionality included, as well as a lot of new features to extend your order grid, improve mass order operations, etc. Also, you can ease the RMA request management with the useful addition to your advanced order grid. Open any order from the grid and get information on the request details. In Magento, handy order management instruments are the key to success in handling orders. By default, no product information is shown on the order list page, which is very inconvenient. The module allows to display all order information on the grid - product thumbnails, names, SKUs, color, shipment and invoice data, etc. So now you can quickly see which products were bought without opening the order view page. 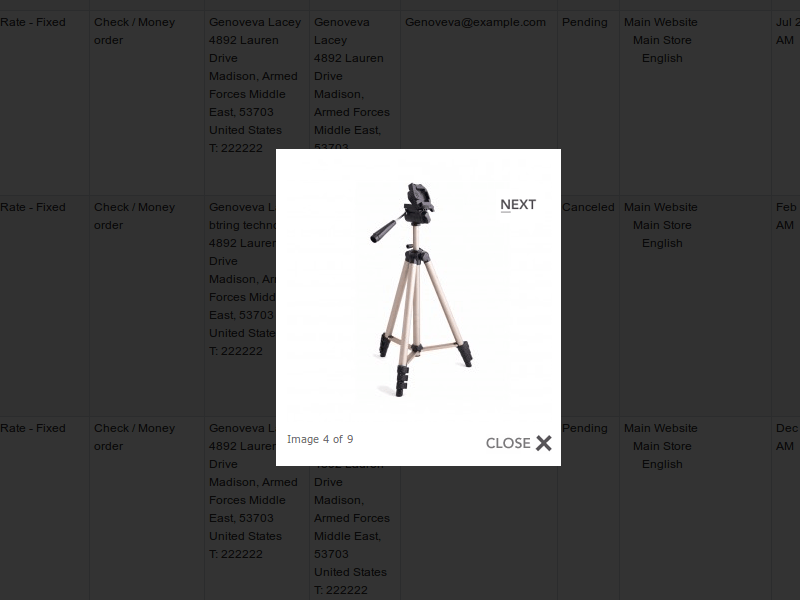 The module lets you see product thumbnails on the order grid. 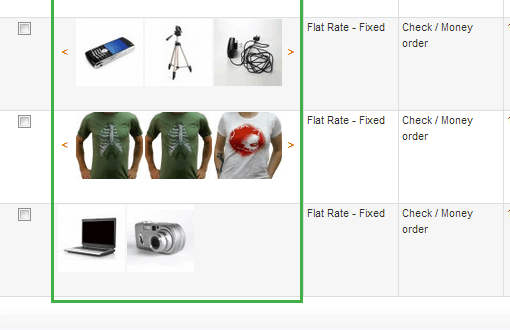 When there are more than 3 products in an order, the thumbnails are displayed in a slider to save space. For your convenience you can display only part of the products for big orders. There is also a convenient zoom option available in the slider. It is possible to specify the number of products you would like to see by default for each order. Complete list of products can be seen in an AJAX-based popup window right on the order. 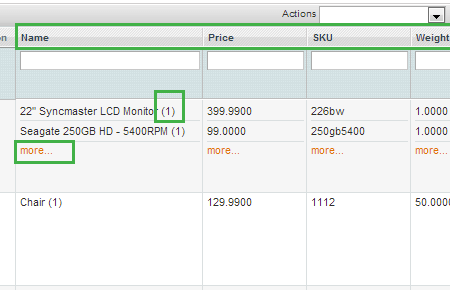 Flexible order search by chosen product attributes, which helps to find relevant orders right away. You can select which product attributes to show on the order grid - SKU, name, color, size and so on. You can filter and sort orders by each of the attributes. 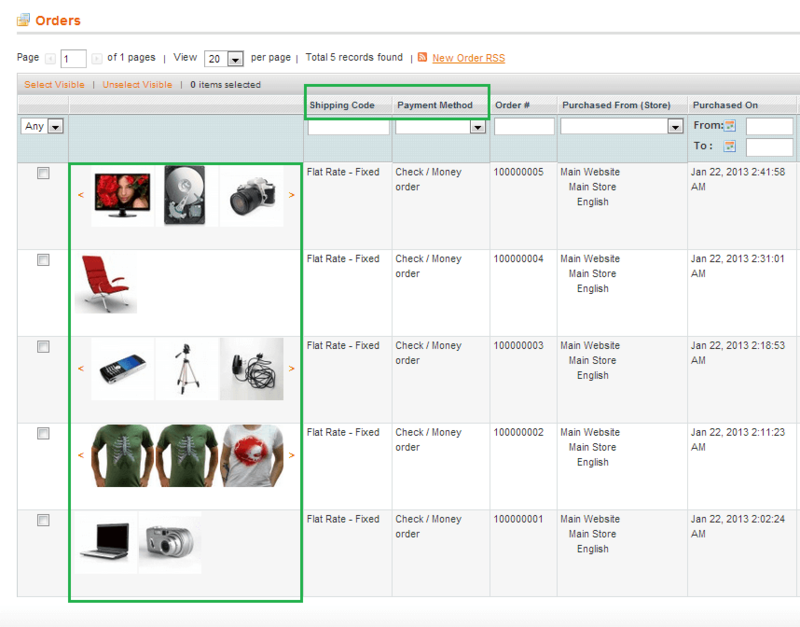 The number of ordered items for each product is shown together with product name in the additional column, when 'name' attribute is set to be displayed on the grid. Now you don’t have to calculate total order weight. You just can add this parameter to the grid and it will be calculated automatically. Add new column ‘subtotal’ to the order grid to see ordered products price before taxing. Now more useful columns are available for adding to the order grid. 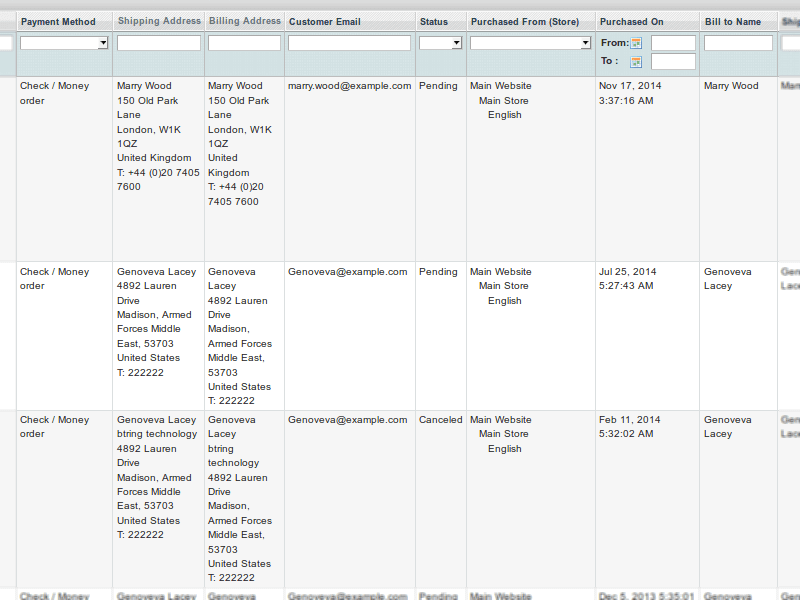 You're able to display shipping and billing address parts, such as country, state, zip, city, in separate columns. When you have a long list of orders, it can be time-consuming in your Magento get order items, which have to be processed and need your supervision. A good solution is to just hide completed or cancelled orders. You are free to exclude or include orders with any statuses - 'on hold', 'payment review', 'pending', etc. Optimize the list orders to process them conveniently. Besides detailed information about each product included into the order, shipping and payment data is extremely important. 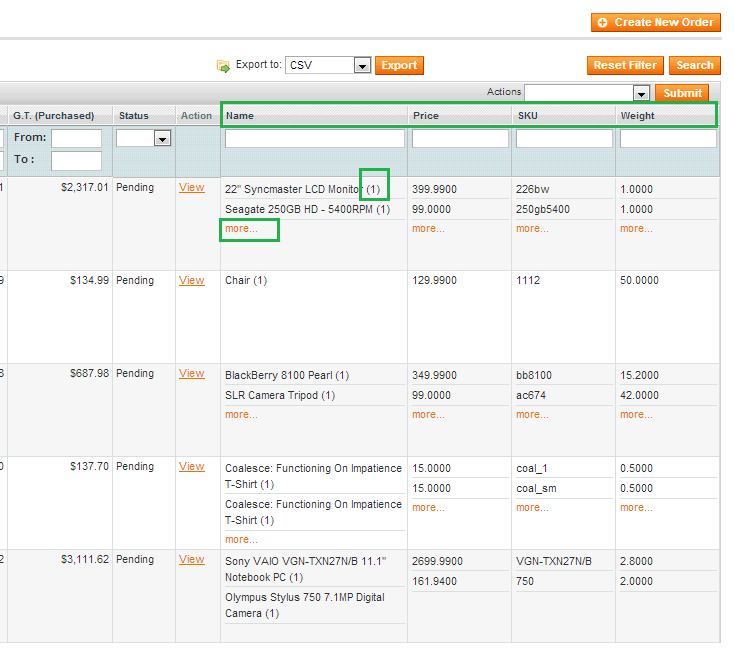 You can add columns for display of coupon code, shipping and payment methods for each order on the grid. Of course, filtering and searching by these attributes is available. Since now you can easily add the phone number to the order grid to have all customer shipping details in one place. You can select which attributes to add to the order grid. This way you can choose product attributes, which are essential for your particular business, to show only the needed information on the order list page. For instance, if you pick product name or SKU, you'll see only this product info on the order grid. If you don't need some of default Magento columns you're able to delete them from the order grid. The order information on the grid contains the chosen product attributes and thumbnails, so you won't need to go to the order view page to see which products were bought in an order. Now you have the opportunity to set the order of columns on your grid to manage information even more effectively. Select which attributes should go first and change the column places accordingly. To maximize the convenience of using the order grid you can change columns width. Choose orders with 'cancelled', 'closed', 'complete', etc. statuses to exclude from the grid. Do you want to extend your product grid functionality as well? Try our Magento grid filter that allows you to create an unlimited number of additional product attributes. By using the attributes, you’ll manage to put all your inventory in order. How to provide customers with more reasons to stay? Timely manage return requests to enhance their shopping experience with our Magento RMA extension. Yes, you can easily add custom product attributes to the order grid. Follow the step-by-step instructions to see how it works. Can I filter orders by attributes in the columns added by this extension? Yes, sure. For example, you can filter orders by customer email, company, city, product brand, coupon code, in fact, by any attribute you’ve added to the Product Grid. Yes, this option is available to help you make your Magento order grid handy. To see how to make it see a screenshot of settings. Can I change the order of the added columns on my Order Grid? Yes, sure, there is such a possibility. You can add columns to order grid or change the columns order in System > Amasty Extended Order Grid. Extended Order Grid allows us to view all important aspects of our orders on one page. It saves us a ton of time by not having to click on each order to view simple order information. And like all Amasty extensions, it comes with the best support in the business! The extention has a high level potential and flexibility. Furthermore,there are no sufficient words to say the the very fast and professional support always fully available. Works perfectly! Thank so much. Makes life so easy, and quick. Very well thought. One wonders how did we do before without it? Excellent. think the value this extension and service adds to my site is exceeding. They definitely help make me feel comfortable abo ut order management and optimize the whole process. We needed to contact customer support twice. Both times we received very helpful and attentive support. OMG, how quick and convenient order management could be! Try it to feel the real difference! A manager who administers my store showed me the module. From first day we bought it, we felt like our life with Magento became much easier. When we had some troubles, support team always responded quickly and worked on the solution really fast! Great! Bought the module from Amasty, because they have thumbnails functionality on order grid! I use extended grid order with great pleasure. This extension is the only one that allows you to display custom attributes of the products directly in the grid of orders. I also had full support from Amasty even after a long time of purchase. I recommend this extension to all those who want to improve the management of its products orders! First i would like to thank you for the service and extensions i purchased through Amasty. Without the Extended Product Grid our life would be much harder in Magento. – Actions column moved to the last position. – Display of billing and shipping address on the order grid. – Display of the number of ordered items for each product. – Ability to hide orders with certain statuses. For example, you can exclude orders with 'Canceled' status from the grid. – Display of shipping and payment methods on the order grid. – Display of used coupons on the order grid.